Wait—what was that? Did you hear that? It… it sounded like a scream! Hold on, guys. Let me just crawl around the corner and check to make sure everything’s okay. Shhhhhh…. SMACK. I tumble right into Kristen Kittscher, who’s wearing a splendiferous wig. “Phew!” I sigh, “False alarm. I guess reading WIG all day has me a bit jumpy. But now that I’ve got you, Kristen, do you mind if I ask you a few questions?” Not waiting for a response, I pull out my handy-dandy spy notepad and my spy pen. Kristen gives me a nod of approval. LM: How did you come up with the idea for THE WIG IN THE WINDOW? 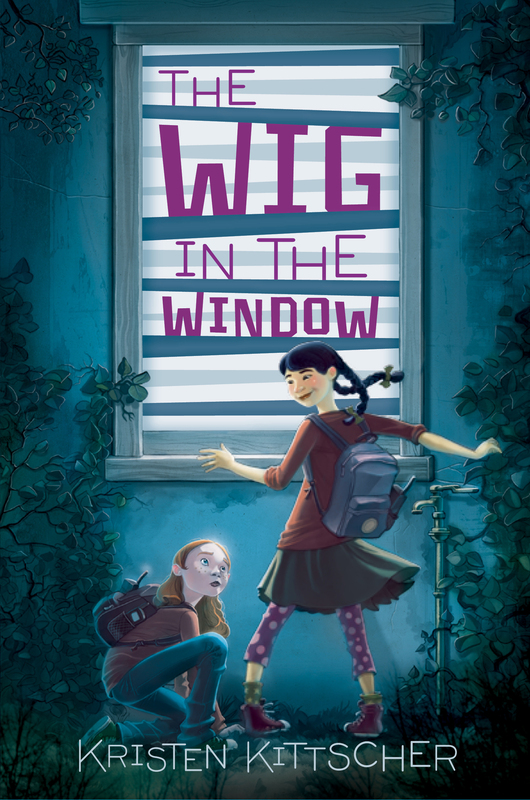 KK: The Wig in the Window was inspired in part by my own adventures as a childhood spy with my friends. I briefly lived in a seaside suburb not unlike “Luna Vista,” and we regularly dreamed up hare-brained theories about our neighbors that we pretended to investigate. We didn’t do a whole actual spying, though: it was more about hiding up in our “spy headquarters” in a loft above her garage and making lots of ID badges and “Most Wanted” posters! Childhood spy group?! That must have been the best thing ever! The fifth grader in me is so envious! So what was the writing process for your debut like? Did you already know the end of the mystery before you started, or did you figure it out as you went along? Writing WIG was circuitous to say the least. It was my first attempt at writing a manuscript, and I just didn’t believe I could do it—so I was constantly writing a few pages and putting it away and moving onto more practical things, like laundry—or more fun things, like going to parties. Not only did I not know the end of the mystery before I started, I didn’t even really understand I was writing a mystery, believe it or not. I started out thinking I was just writing a story about two unlikely best friends. It was a very episodic collection of antics between Sophie Young & Grace Yang, who—practically as an aside!—suspect the middle school counselor is a fugitive. I threw it out and started over again, understanding at last that I was writing a mystery (psychological thriller, really! ), and set to work. I wasted a lot of time not believing in myself—so it’s no surprise that self-doubt turned out to be a major theme in the book. Your perseverance is so inspiring! Self-doubt is definitely one of those universal feelings that hits all writers at some during the publication process. I know I sometimes feel it! *clutches the shambles of my current work-in-progress and mutters feverishly* So, while we’re on the topic… How did you overcome your self-doubt, and what advice do you have for any writers who might be experiencing that feeling? Oh, I don’t know that I have overcome my self-doubt, really—but rather I’ve accepted it as a natural part of my writing process. If I weren’t feeling a little doubtful, I’m not sure writing would be fun for me! Getting in over my head, casting about in the dark, and muddling my way through is just part of it. I wish I were seasoned enough to give advice! I’ll offer this: it seems to me that time, effort, patience and feedback cure all (most?) manuscript ills! So let’s chat about the time long after you casted about in the dark and muddled through–back to when you had a beautiful, finished, beta-read manuscript-version of THE WIG IN THE WINDOW on your desk, all ready to send out into the Internet aether. Talk us through your path from that moment to the book deal! In September of 2010, I had my shiny manuscript all ready to go! I queried five agents, one of whom was Jennifer Laughran. She’d been cracking me up on Twitter for some time, and I really hoped she might enjoy WIG. Several months of silence and few rejections on partials followed, then—at last—in mid-November both Jennifer and another wonderful agent offered representation just when I was about to send out another round. What luck! I chose Jenn, she gave me fabulous revision notes, and we went out on submission a couple months later. Shortly after, Rosemary Brosnan at HarperCollins let Jenn know she was taking my manuscript to acquisitions. I was over the moon! I was such a fan of so many of her authors (Rita Williams-Garcia, Norma Fox Mazer, Lauren Oliver). The story takes a sad turn there, though. Just days before Harper’s offer came in, my father died in a freak accident right in front of me. Traumatized and reeling, I didn’t care much that WIG had sold. It was just a footnote at a very dark time. A sudden tragedy like that certainly puts all of our writerly angst in perspective. Fortunately, there have been so many other happy milestones in this debut journey that I’ve been able to relish. I’m so glad that WIG will be coming out just after Father’s Day this year—it’s a perfect time to celebrate this accomplishment and remember my wonderful dad. He would’ve been very proud. My gosh, I’m so sorry; that is really the absolute worst. WIG’s release certainly sounds like a great way to commemorate your father. You mentioned some of the milestones in the debut journey… Was there anything that surprised you about the publishing process? What was the most exciting milestone? Thanks so much, Lauren. He would have found this all to be quite a kick, and I’m looking forward to the celebrations. The first time through it’s all sort of a surprise—particularly that part where a check arrives in the mail for something you made up. I think I was most surprised by, in the later stages, how much my editors and I worked by hand. They sent their line edits in pencil, I entered in all copyedits and changes to the “first pass pages” in pen, which were then entered in by someone else. As for milestones, don’t get me started! I’ve been treasuring this newness— and fearing someday I’ll think all this gloriousness is old hat. It was particularly special when author Kirsten Miller (KIKI STRIKE, HOW TO LEAD A LIFE OF CRIME) wrote me a funny, kind, complimentary note after she read THE WIG IN THE WINDOW. She then tweeted about one of my girl sleuths being her new favorite character and “one of the most fascinating masterminds around.” Praise from an author I admire so much would have meant a great deal as it was, but it was all the more special because KIKI STRIKE inspired me to write for middle graders in the first place. Awww full circle! I love that! So… inquiring minds NEED to know: what’s next for you? More middle grade? You bet! There’ll be a sequel to THE WIG IN THE WINDOW : THE TIARA ON THE TERRACE. We’ll see from there… I certainly enjoy my sleuths and have plenty more ideas of adventures for them. Care to suggest future (strange head thing) on the (outward facing architectural feature) titles? In TIARA, Young & Yang go undercover in their town parade’s “Royal Court” to stop a murderer: Miss Congeniality, middle-school style! It’s been challenging for me to write because I’m not used to big bombastic crowd scenes and parades and known nothing about beauty contests, but I think this story and the setting are just so much fun. OHMYGOODNESS GIVE ME NOOOOOWWW! I can’t wait! TIARA ON THE TERRACE looks fantastic!!! Middle school Miss Congeniality is pretty much the best pitch ever. Anyway, we’ve sort of danced around other authors you admire in other answers, but let’s end on that note: as this community is All for One and OneFour KidLit, we’d love to know two or three books that inspired you as a kid! Ha!—And thanks for the enthusiasm! Puts some wind in my sails. Oh, I could go on for hours about books I love. Favorites as a kid? From the Mixed Up Files of Mrs. Basil E. Frankweiler by E.L. Konigsberg, Judy Blume’s Blubber, The House with a Clock in Its Walls by John Bellairs were at the top of my list. Thanks so much for joining us today, Kristen! We at OneFourKidLit have all suspected that you were the loveliest author ever, and now we know you are! Mystery SOLVED! 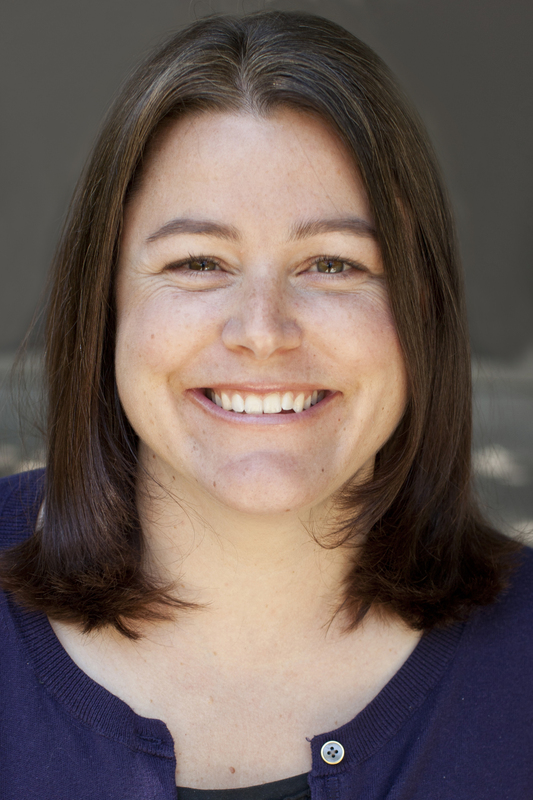 Kristen Kittscher is a writing tutor in Pasadena, California, where she lives with her husband. She is a graduate of Brown University and worked for several years as a middle-school English teacher. The Wig in the Window is her first novel. You can visit her online at http://www.kristenkittscher.com. Lauren Magaziner is a 4th grader at heart, watches way too much TV, and loves to steal people’s toes to make Toecorn, which tastes like chewy, meaty popcorn. Only one of those is true. (Okay… you caught me. They’re all true.) Her MG debut THE ONLY THING WORSE THAN WITCHES—about a boy who becomes a witchling’s apprentice in a town full of dangerous, Toecorn-loving witches—is forthcoming from Dial/Penguin in Summer 2014.